Peptide SDEYLRSYFIYSMC, corresponding to amino acid residues 207-220 of human P2RY1 (Accession P47900). 2nd extracellular loop. Homology Rat - identical; mouse - 12/14 amino acid residues identical. 1-3. Anti-P2Y1 Receptor (extracellular) Antibody (#APR-021), (1:200). 4-6. Anti-P2Y1 Receptor (extracellular) Antibody, preincubated with the control peptide antigen. Immunohistochemical staining of mouse hippocampal CA3 region using Anti-P2Y1 Receptor (extracellular) Antibody (#APR-021). 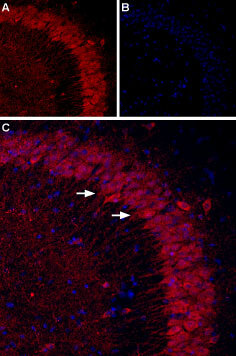 A. P2RY1 staining (red) appears in the pyramidal layer (arrows). B. Nuclei staining using DAPI as the counterstain (blue). C. Merged images of panels A and B. ___ Cells stained + Anti-P2Y1 Receptor (extracellular) Antibody (#APR-021), (5 μg/1x106 cells). Cell surface detection of P2RY1 in intact living rat pheochromocytoma PC12 cells. A. Extracellular staining of cells using Anti-P2Y1 Receptor (extracellular) Antibody (#APR-021), (1:50) followed by goat anti-rabbit-AlexaFluor-594 secondary antibody (red). B. Merge of extracellular staining with live view of the cells. Jin, J. et al. (1998) J. Biol. Chem. 273, 2030. Anti-P2Y1 Receptor (extracellular) Antibody (#APR-021) is a highly specific antibody directed against an extracellular epitope of the human P2RY1. The antibody can be used in western blot, immunohistochemistry, indirect flow cytometry and live cell imaging applications. It has been designed to recognize P2RY1 from mouse, rat and human samples. This antibody recognizes a different epitope and thus can also be used as a control for detecting P2Y1. Anti-P2Y1 Receptor (extracellular)-ATTO-488 Antibody (#APR-021-AG).